Terms like bad loans, stressed assets, and non-performing assets (NPAs) are making waves in banking-related news. More recently, bankers have been insisting that the problem has largely been addressed and this situation would soon improve as recoveries begin. But then came the announcement of fraudulent transactions of around Rs11,400 crore at Punjab National Bank, the second largest public sector bank in the country. To put things in perspective, stressed assets in Indian banking system are about Rs10 lakh crore, said the chief economic adviser Arvind Subramanian (read here). So, the PNB fraud could add about 1% to the existing pile of stressed assets in the system. After the PNB episode, you may have read doomsday predictions for your bank deposits on social media. Are your deposits really in trouble and should you worry about the health of banking system in India? The level of non-performing loans, as a share of loans given out by banks, has been rising. According to Krishnan Sitaraman, senior director, Crisil Ratings, gross NPAs are expected to reach 10.5% in March 2018, compared to 9.5% in March 2017. “If we look at overall asset quality in the banking system, of which public sector banks occupy two-third share, the overall asset quality is a matter of concern. In fiscal 2019, we expect a further upside to NPAs before it starts coming down,” Sitaraman said. The NPA problem is more acute for public sector banks. “Private sector banks are doing comparatively well, they are not reporting losses. Most…have had higher retail focus as against public sector banks, which have suffered because of corporate exposure gone bad,” said Aditya Acharekar, associate director, Care Ratings Ltd. The silver lining is that fresh slippages, incremental addition to NPAs, are declining as around 70% of the total stressed assets have been recognized as NPAs. So, there is less remaining from where fresh slippages can happen. With the problem identified, and being addressed as per the Insolvency and Bankruptcy Code, it is expected that recovery in some of these NPA cases should start in 2018-19. Moreover, government and regulator are closely monitoring public sector banks’ health and capital adequacy. “They are monitoring certain parameters like sharp declines in capital adequacy or increase in NPAs, and if these cross certain thresholds then such banks are placed under ‘Prompt Corrective Action Framework’. Today around 11 banks are under this framework and they are asked to come up with an action plan,” Sitaraman said. There have been times when gross NPAs in banking were higher than current levels and even in those times there were no instances of default of deposits in public sector banks, Sitaraman said, adding that government has supported banks whenever the need arose. “In the past, if a bank was found unviable, it was merged in some other bank. So at all points, depositor interest was safeguarded by the government and regulator. Reserve Bank of India (RBI) is a proactive regulator and will take all necessary steps to safeguard depositor interest,” Acharekar said. For instance: In 2004 Global Trust Bank, a private bank, was merged in Oriental Bank of Commerce, a public sector bank, to protect depositors’ interests. Global Trust had suffered massive losses and its net worth was wiped off. Yet, the depositors did not lose any money. While the expectation is that government would not let any bank fail, there is also an institutional provision to protect depositors, to some extent at least. The Deposit Insurance and Credit Guarantee Corporation (DICGC) was established in 1978 as an RBI arm that offers an insurance cover to depositors. In 1993, a limit of Rs1 lakh was set for this deposit insurance. Then there is the Financial Resolution and Deposit Insurance (FRDI) Bill, 2017. It envisages setting up of a resolution corporation which will replace the DICGC. The Bill is currently being looked into by a parliamentary standing committee. “FRDI Bill is is expected to provide flexibility to enhance the deposit insurance, which will further benefit retail depositors,” Sitaraman said. 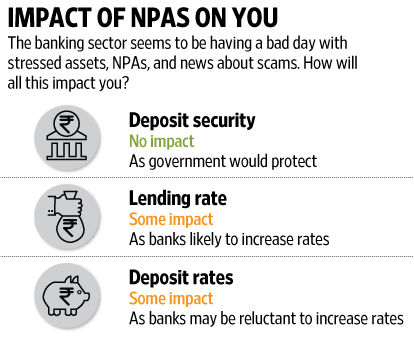 Even if your bank deposits remain safe, and are insured to an extent, it does not mean that the NPAs will have no impact on retail depositor and borrowers. “There is an indirect impact of the entire NPA issue on retail depositors and borrowers…. Because the banks cannot support fresh loans as their NPAs and losses are going up, they do not have fresh capital to lend. If they do not lend, the credit demand goes down,” said Anil Gupta, vice-president, financial sector ratings, ICRA Ltd, a ratings agency. He also said that while there has been some growth recently, it is partly due to a low base. For a bank, an NPA is a loan (an asset) that stops generating income. Banks have to make provisions for the losses likely to arise out of NPAs. This impacts their profit, and it makes the banks keep their interest rates on loans at a higher level. Similarly, to reduce outflow due to interest paid on deposits, banks can reduce deposit rates. “So there is a chicken and egg situation. There is no money to lend, so there is no borrower. As there is no borrower, the banks have no money to lend,” Gupta said. While banks have been proactive in reducing deposit rates, there has been reluctance to pass on the interest rate cuts in the lending rates in the most recent rate cut cycle. Even the Reserve Bank of India has expressed concern over the same. In order to improve rate transmission, the RBI introduced the marginal cost of funds-based lending rate (MCLR) in 2016, and in its recent monetary policy announced the linking of base rate and MCLR from April 1. Typically, it is assumed that lending and deposit rates are correlated. So when under stress, banks try to reduce the costs with lower deposit rates, but there is also reluctance to reduce income at these times, so they may not reduce the lending rates. “For a retail depositor there is no need to panic. Even if the NPA level had been higher than what it is, the safety of bank deposits is sort of supported by the sovereign. Default (on deposits) is ruled out,” Gupta said. In fact, there have been no defaults on deposits in scheduled commercial banks in India, as the government has taken care of such situations, as it did in 2004 Global Trust Bank. This happened even as there is no law to guarantee the deposits, and even the deposit insurance is limited. It was done because the government realises that faith in the banking system cannot be allowed to dwindle. A few days after the fraudulent transactions at PNB first came to light, it was revealed that the alleged fraud could be Rs1,300 crore more than estimated earlier. Since then, the government has instructed public sector banks to examine all their non-performing loans of over Rs50 crore for possible fraud. So, even if some more cases of fraud come up and social media gives you grief over panicky forwards, stay calm.